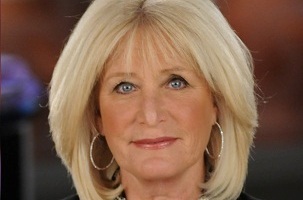 Susan Wornick has been anchor of WCVB-TV’s Midday newscast since February 1989 as well as a member of Team 5 Investigates, WCVB’s investigative unit, and she also serves as NewsCenter 5’s consumer reporter. She has received three regional Emmy Awards and the prestigious Silver Gavel Award from the American Bar Association. Natick native and Emerson graduate (BA, ’71), Susan Wornick has been anchor of WCVB-TV’s Midday newscast since February, 1989, as well as a member of Team 5 Investigates, WCVB’s investigative unit, and she also serves as NewsCenter 5’s consumer reporter. Joining in 1981, Wornick has won many awards during her tenure at WCVB. In 2010, the National Headliner Awards program recognized Wornick for a Team 5 Investigates report that exposed problems with rusting Toyota Tundras. This story helped lead to a national recall of the vehicle. In 1991, Wornick received the prestigious Silver Gavel Award from the American Bar Association (ABA) for a news series she reported called “Punishment Without A Crime” which examined a Massachusetts law which allows the imprisonment of innocent women with drug or alcohol problems. It focused statewide attention on the insufficient number of Massachusetts state treatment facilities for women, including teenagers, who often ended up in prison cells instead of proper treatment programs. Wornick has also received three regional Emmy Awards, most recently 2009 for a story on fire safety. In 1984, she shared an Emmy Award for coverage of a verdict in a controversial trial, and in 1983, she shared an Emmy for reporting on the crash of a World Airways plane at Boston’s Logan Airport. In June, 1985, she gained national prominence by refusing to reveal a news source. Wornick was held in contempt of court and narrowly averted a jail sentence. Wornick was an anchor and reporter at WHDH Radio in Boston from 1979 to 1981. She also worked for WBZ Radio in Boston as an anchor/reporter, where she won several Associated Press and United Press International Awards for radio journalism. Wornick spends a tremendous amount of time volunteering in the community and serving as a celebrity auctioneer for many organizations including the Mass Coalition for the Homeless and Mayyim Hayyim. She helps to raise awareness and funds for breast cancer research and supports Rodman Celebration for Kids and the Jewish Community Housing for the Elderly. In 1988, Wornick was honored by the State Department of Youth Services for her volunteer work with troubled teenagers. In 1995, she was recognized with an Honorary Doctorate of Humane Letters Degree from Becker College in Worcester, MA. In 2005, The National Academy of Television Arts & Sciences recognized Wornick with the Silver Circle for 25 years of service to WCVB and the community.